School Hosting Control Panel - School Hosting UK Dedicated Hosting for Schools. 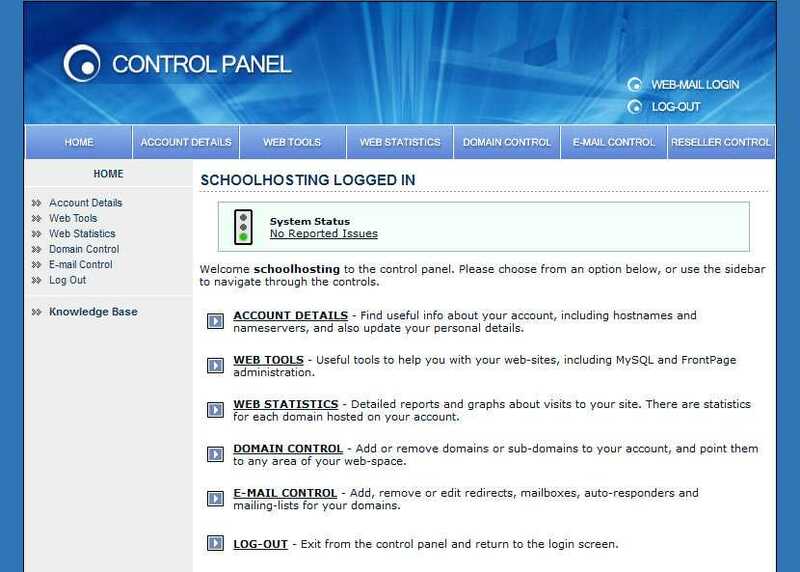 The school hosting control panel used in all of our hosting packages. Was design in house and not used an off the shelf product which allows us to make our system unique and build in our own special features. The control panel allows to control the features of your account like e-mail, domains, web statistics and much more. Its user-friendly graphical interface is very easy to use even by the most novice of users. Account details is a useful section on the control panel where account usage information is shown plus name servers, host names and other key bits of info for your account. You can also update your details, upgrade your account and change passwords. Web tools is a section on the control panel which contains tools to help you use your account like a Java Tomcat manager, FrontPage manager, Graphical PHP admin interface and SSL info section. All domains on the system have full web statistics to allow you to monitor traffic for your domains. Using the multiple analysis tools available, you can see how your site is being used, where visitors have come from and much more. E-mail control gives you complete control over your e-mail at the touch of a button, enabling your to create and delete mailboxes, redirects, mailing lists and auto-responders. All accounts come with access to our web-mail system, which allows you to receive e-mail through your web-browser. You can also send and delete mail from your mailboxes at touch of a button. We have a full knowledge base with tutorials and how-tos to make setting up and running your account easier.